Where Does The Mountain Ojos del Salado Rise? An active strato-volcano, Ojos Del Salado rises to an elevation of 22,615 feet in the Andes Mountain Range in Argentina. Ojos Del Salado, as seen from the Chilean side of the border. Nevado Ojos del Salado, with a height of 22,549 feet (6,873 meters) is the tallest active strato-volcano in the world. The mountain stands tall along the Argentina-Chile border near the Atacama Desert, 184 kilometers east of the Chilean city of Copiapó, and is part of the Andes Mountain Range. After Mount Aconcagua, with a height of 22,838 feet (6,961 meters), Nevado Ojos del Salado is the second tallest mountain of both the Southern and Western Hemispheres. The mountain is located 600 kilometers to the north of the taller Mount Aconcagua. Persistent fumaroles (opening’s in earth’s crust emitting steam and gases) near the summit of the volcano are indicative of its current "active" volcanic status. The name of the volcano, Ojos del Salado, is derived from the Spanish words for ‘salty eyes’, which probably refers to the salt deposits in the form of lagoons, or ‘eyes’, in its glaciers. As per reports of the Global Volcanism Program of the Smithsonian Institute, the last eruption of the Ojos del Salado happened around 1,300 years ago. However, there were reports about the emission of minor volumes of volcanic ash from the mountain in 1993. Jan Alfred Szczepański and Justyn Wojsznis, members of a Polish expedition, were the first climbers to summit the Ojos del Salado, doing so in 1937 after they succeeded in reaching the eastern tower of the twin-towered volcano. 19 years later, a Chilean team managed to ascend the mountain's western tower. The Ojos del Salado is a popular spot for mountaineering activities, and also one that draws a large number of adventurers to summit the mountain by way of land vehicles since the Ojos del Salado is the tallest mountain in the world to be reached by a land vehicle. The record for doing so in the fastest time was set in 2005 by a team led by Matthias Jeschke, who ascended the mountain up to an altitude of 19,717 feet on a Toyota Landcruiser 90. Their record was broken by other motorists over the next few years. Besides climbing, the desert habitats around the mountain, which support a wide variety of rare and unique endemic flora and fauna, are also major tourist attractions in and of themselves. Mineral deposits in the mountain and its surrounding regions also allure miners into coming to this area to seek their fortunes. 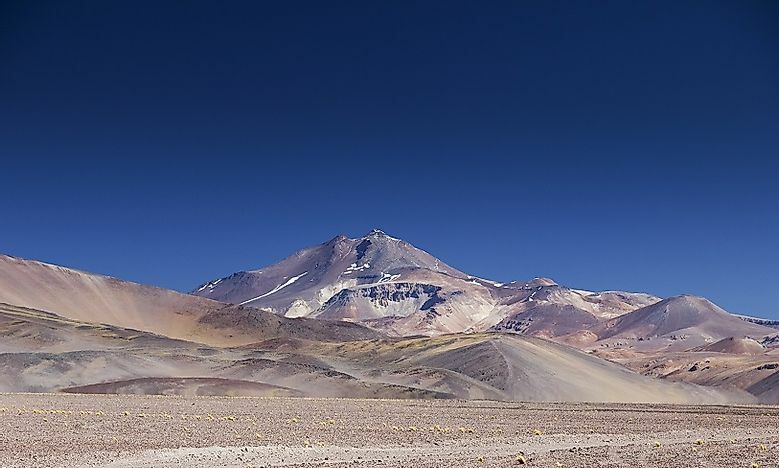 Since the Ojos del Salado is located close to the Atacama Desert, there is very little precipitation in the region, though the peak of this mountain is covered with snow primarily during winters. However, the mountain, despite the dry conditions, hosts the highest crater lake in the world, which sits at an elevation of 20,960 feet. The lake has a diameter of approximately 330 feet. The flora and fauna of the mountain and its surrounding desert habitat is limited to species that have suitably adapted themselves to the dry climatic patters of the region. A large number of plant species, including around 60% of the 550 species of vascular plants in this area, are endemic in nature. Fauna of the region include such mammalian species as the Pampas cat, Culpeos, Patagonian weasels, Mexican free-tailed bats, the Atacama myotis, Elegant Fat-tailed Opossums, and Vicuñas. Birds like Rufous-collared Sparrows, hummingbirds, Andean Condors, Andean Swifts, and Grayish bay-wings, as well as some species of reptiles and amphibians, can also be seen either in or around Ojos del Salado. Moderate threats to the mountain's ecosystems are imposed upon it by the mining activities that are carried out in the Ojos del Salado region. Few human settlements occur in the landscape surrounding the mountain. Even still, overgrazing by domestic livestock, clearance of rare plants for gathering firewood, and the killing of the native fauna for meat or skin by the humans dwelling in these scattered settlements are sufficient to serve as a source of ecological damage in the region. Climate change could lead to a significant retreats of the volcano’s glaciers in the near future, disturbing the hydrology patterns of the ecosystem in a devastating manner. Since some evidence of volcanic activity of Ojos del Salado has been reported in recent years, the threat of a major eruption from this volcano, as always, still exists.